Chalet nr 25, directly under the roadway, in 2015 under architecture completely restyled and modernized, beautiful huge balcony (built in 2014) with beautiful views over the valley and only 100 meters from the ski lift. The charming village has 2 fast gondolas that take you directly to the large ski area (> 250 km of ski runs!). Nice restaurant and nice bar at the end of the street (150 meters). After unloading at the chalet you may park your car in a covered parking garage (about € 23 per week) next to the restaurant or on the public road (free of charge). In the village you will find a fine ski school (ski and snowboard lessons, for beginners as well as experienced wintersports enthusiasts), a supermarket and several ski rentals, restaurants and bars. The chalet is a so-called type 4, equipped with a spacious kitchen, good beds, great showers (2 gigantic boilers for hot water, so you can not run out hot water), plenty of storage space for skis, shoes, sleds etc. Radio, several televisions with satellite reception, unlimited broadband wifi, blu-ray DVD player with USB connection. 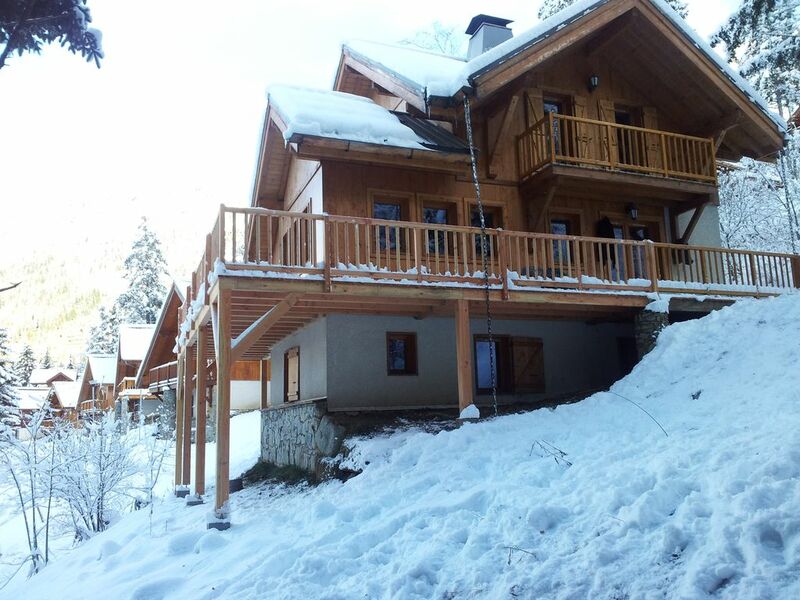 Wonderful chalet for a week with friends or family, children and pets! Cyclists, mountain bikers and downhillers: The 21 turns to Alpe d'Huez, the legendary mountain from the Tour de France, remains the ultimate challenge for many cyclists. But what about the Cols de la Croix de Fer, Glandon and Galibier? These Alpine giants are also within reach. Because of the excellent care, many participants in events such as Alpe d'Huzes and the Marmotte come to Oz every year. The reputation of Oz Station continues to grow among the global practitioners of XC, 4X and Downhill. The tracks are among the most challenging in the circuit. Oz has already welcomed the National and Open French Championships. It is even whispered that Oz is on the nomination to organize a World Cup. Motorcyclists: our chalet is your ideal home base for an unforgettable motorcycle vacation in the French Italian Alps. After a challenging route through impressive destinations and breathtaking vistas, it is a good time to tell stories about the experiences of the day in a relaxed atmosphere and while enjoying a drink with others. Park your motorbike in the garage located next to chalet. Hi. We live in the Netherlands and together we have 5 children from 15 to 21 years old. From the Netherlands Oz-en-Oisans is easily accessible. The first years we went by plane (Easyjet, Geneva), since a number of years, however, we fly in the winter season on changeover days (Saturday) in one and a half hours from Amsterdam and Rotterdam to Grenoble. Love at first sight. In the autumn of 2001 we flew with the estate agent to Geneva and from there to Oz-en-Oisans by car. The weather was great, even in October, it was even so good that we were outside that day. After a visit to the chalet, we had no doubts and told the real estate agent that we wanted to buy it. The Alpe d'Huez ski area is fantastic and much better than most ski resorts that we know. Our chalet is located next to the slopes, which of course makes it very special. Eye-opening were the lack of queues in front of the skilifts. Every year we go at least once with friends and family - it's big enough! In recent years we have always set aside money to completely restyle and renovate the chalet. Three years ago we had the enormous balcony built, two years ago all bathrooms, the kitchen, the floors and various furniture were renewed. An extra hammam has been created and there is more storage space for the equipment. Large, luxurious, styled, well located: right under a dead-end road, so no long stairs and next to the skilifts. Good wifi in the chalet, which is exceptional in the area. This was the second time we rented this chalet with a group of 20 friends. Again it was perfect! We had a wonderful stay. The rooms are clean and the livingroom and diningarea is very cosy. Our contact at the site, Beverley, was also very friendly. Beware that the house is a littlebit noisy, especially for the sleepers on the mezzine, so if you have light sleepers you might want to take earpluges or something. The skilift is very close (2 min. walk) and you can walk to the supermaket and bakery. The skiarea is wonderful! I would undoubtebly recommend this place. Lovely property. Enough space for all 21 of us. Ideally situated for the piste. Well presented chalet which accommodated 21 people fairly well. Good facilities and high quality furnishings. An excellent chalet, our 2nd stay there. There's plenty of living space for a large group. The chalet is on the end of a row and quite private compared to some. We mainly cycle but have done other activities in the area, there's plenty to do. A hike over to Alpe d'huez and other areas up the hill is worth the effort, so beautiful views. If you are cycling then you'll enjoy the bonus hill each day back up to Oz. I suspect I'll be back again for the tour or dauphine. Thank you for your lovely review and great to hear you enjoyed your stay in our chalet again! We really enjoyed our stay in Oz, and this chalet was perfect, the view on the terrace was stunning, the chalet was clean and spacious. There was 14 of us on a cycling break, we were on the doorstep of the Col du Glandon (Tour de France 2017) and a short ride from Alpe du Huez, its the perfect location. Sander was really helpful through the whole process, I was in regular contact with him asking many questions and seeking advice, a pleasure to deal with. We'll be back again! Thank you for your lovely review and glad you had a good stay in our chalet! Hope to see you again soon. We were a party of 20 that stayed for a week at the chalet. On arrival, we were very impressed with quality and standard of everything. The attention to detail is far better than most places that we have stayed in. We certainly recommend the catering services of Serges and Patty which were recommended by the chalet owner. There is a small walk to and from the piste, but well worth it to be able to stay in such a lovely place. Thank you for your lovely review. It certainly feels good to see all our efforts from last years make a stay in our chalet highly comfortable and that our guests appreciate that. Hope to see you again soon! A beautiful place to stay on the lower side of Oz Village close to the small Poma approx 100m away which was handy for any beginners or getting you to the gondola in the morning to save the walk uphill. Everything that you would wish and more. A very spacious Chalet, recently modernised to an exceptional standard ,very clean and everything provided for you, no worrying about taking towels etc as all provided ,Dishwasher was a godsend for glasses and wifi was good even taking into account the number of phones and tablets connected. Beds are lovely and comfortable as is everything else .Lovely decking area to side and front looking out over the valley below. The refurbishment carried out to the chalet is first class, the bathrooms are all of a quality finish as is the kitchen together with its modern appliances. Sitting area was extremely comfortable for our party of 12. Chalet also has a super dining area. Only sorry we didn't spend more time in, however, snow was good and the sun was out and we strolled in town each night ! Communication with the owners was excellent, we were also given a car park space for our weeks stay which was unexpected. I cannot emphasize enough how impressed we all were of this accommodation which made our holiday. This lovely review was posted by a party of 12. Of course, weatherconditions were great for them, but we're very happy with the nice words about the chalet, which took us a lot of time to make it as comfortable as we'd like to have it on our own holiday. We've always one card for a car available for renters in the public garage. Other guests with cars can however park there as well, for around EUR 25 per week. Enough parking places can be found there, as well as on the street which is free of charge. Thank you for your review and hope to welcome you again! Directly on the slopes in Oz en Oisans with access to 240 km of runs in the Alpe d'Huez ski area, this superb chalet is situated right in the heart of the Massif des Grandes Rousses. At holiday complex Le Clos du Pré you will find this attractive situated chalet. At the centre of this complex you will find the attractive hotel with the renowned restaurant La Parisienne and the very popular OZZIE Bar. Relaxation is the key word whilst at the same time it boasts a broad range of fantastic ski and snowboard facilities: the ski lift starts literally on the doorstep! At the skistation there is a swimming pool including sauna facilities and there is even a skating area! Shops and ski school are just across the street. Golf: Alpe d'Huez is known for the climb during the Tour de France and the Olympic Winter Games of 1968. As a ski resort, it is one of the largest in France. It consists of an exceptional ski area of 800 hectares on your doorstep with 240 km of slopes, 38 green, 31 blue, 33 red and 16 black slopes, including the 16 km long Sarenne, the longest in the world. The 86 lifts take you quickly to the peaks with the highest point at 3,300 m, the Pic Blanc. Partly because of the 860 snow cannons, the area offers snow from early December to late April. There is a floodlit piste in Oz evening slipping, 1x per week. You will find two snow parks and a boardercross for fun skiers and boarders. For enthusiasts, there are more than 20 off-pistes as well as more than 50 km of cross country tracks and 30 km of hiking trails. The ice cave at 2,700 m is a must. You can also take a dog sled ride or snowcat. Après ski course begins in the Ozzie Bar You can relax in the indoor pool with sauna.